Meet Nova, shop mascot for Thunderbird Barbers. 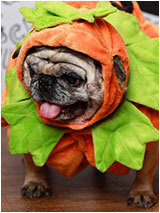 The 10 year old Pug, seen here celebrating Halloween, has been coming to work with Sheri Garczynski since she was five months old. Nova enjoys all the love she gets from Thunderbird customers and her many Downtown friends. Stop in and say hi to Nova and Sheri! Ann Dixon had this house constructed in 1909. From 1920 to 1989, it was the home of Henry “Rico” and Mary Zarini and their family. He was a butcher in town who remembered the then 12” tall trees in the front yard in the 1920’s which are now among the tallest trees in Old Town. Louisville Wellness Center announces the opening of its new office at 608 Main Street, just three blocks away from its current location on Main Street. Check out their new digs and check up on yourself with all their great services. SAVE THE DATE FOR THE PARADE OF LIGHTS AND INTRODUCING LOUISVILLAGE! Get ready for an entire evening of festivities before and after the Parade including First Friday Art Walk special deals, visits with Santa, a petting zoo and choir performances. The Museum will be open as well with plenty of Yuletide goodies. Don’t miss the quaint and festive LouisVillage! Fun for the whole family! Small Business Saturday is November 26. Support our Local Merchants and Shop Small! The gallery will present four accomplished artists to help bring in this traditional time of the year! 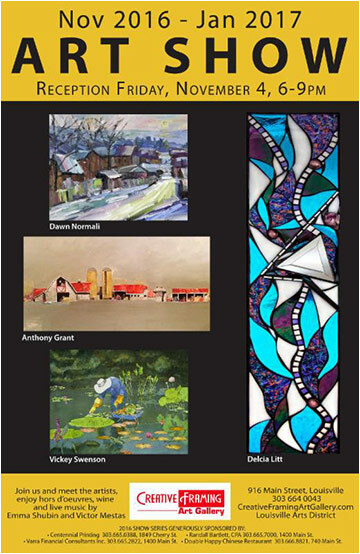 Returning by request, are popular artists Anthony Grant and Delcia Litt with their latest creations in oil, acrylic and dramatic glass mosaic. Also for the first time in the gallery are Vickey Swenson and Dawn Normali. Giving rapture in oils and watercolors, their works will capture your attention and spirit! All four artists offer beautiful additions for your home and office and make spectacular gifts for the holidays. 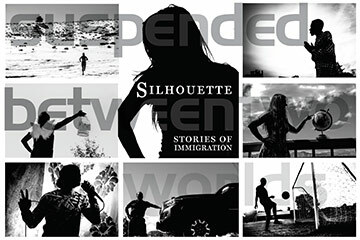 Photographer and storyteller Dona Laurita has been working with individuals willing to share their stories through a spoken and photographic interview. The results are beautiful visual silhouettes colored by the imagery of the story and will be revealed at openings for the November and December Art Walks. Don’t miss these spectacular shows. Contact dona@donalaurtia.com or call 303-818-1616 for more information. Add Some Music to Your Artwalk! Stop by to see performances by Dana V. Music’s talented students! The event is FREE and will feature a variety of songs and instrumental performances, so come support some of Louisville’s very own talent! The continued series of programs based on the theme of Louisville’s Larder, features agriculture, restaurants, the history of Italian influence on the local food culture, and a look at a typical family’s kitchen, garden, and larder... and oh, beer and bars. 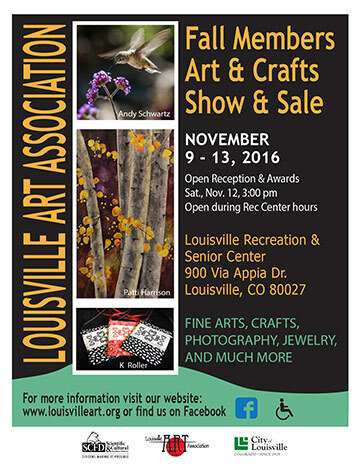 Always a favorite for holiday gift shopping, and a little something for yourself too, this show features fine arts and crafts, photography and much more. Opening reception is November 12 at 3:00 pm. Open to the public. The Book Cellar has entered a contest sponsored by 1st Bank of Colorado to win $20,000 to improve its small business. They have created a 90- second video detailing the story of the business and their goals of how they would use the prize money. If selected as one of the 5 finalists in Colorado, the video will be posted on the 1st Bank Facebook page and the public will vote for a winner. Voting will take place November 6 – 13 with the winner announced on November 14th. We wish them the best of luck! Here’s to good reading! Join in the fun with samples, treats and holiday cheer, plus 15% off your purchase (some exclusions apply). Also, enter to win a drawing for some great kitchenware prizes. And don’t forget there’s parking behind the store which can be accessed through the alley behind Huckleberry. Now’s the time to join FingerPlay Studio’s Craftmas Challenge. For every gift you make using yarn from FingerPlay Studio, you’ll be entered to win a gift for yourself. Every gift gets you entered into the Grand Prize drawing. Winners will be announced at FingerPlay Studio’s Holiday Sip and Knit, Friday, December 10th 6:00 – 8:00 pm. Everyone is welcome to participate. Visit FingerPlay Studio for details. 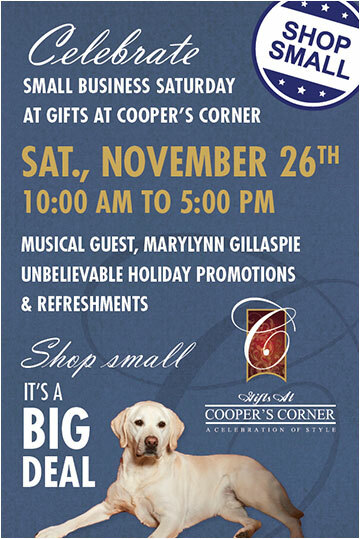 Celebrate Small Business Saturday at Gifts at Cooper’s Corner with unbelievable, one day only, Holiday promotions that you won’t want to miss! And don’t miss live music at noon with jazz singer MaryLynn Gillaspie, and refreshments from Louisville’s own Mudrock’s Tap & Tavern. 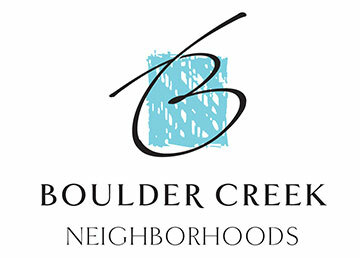 Boulder Creek invites you to grab a cup of coffee, and tour two professionally designed homes. The amenities coming soon to DELO are world-class, and the homes are just a short walk from Downtown Main Street. Community Manager Chris Mason will be on hand to answer any questions as you learn all about what a low-maintenance lifestyle is like in Historic Downtown Louisville. Contact cmason@livebouldercreek.com for more information. Front Street Hair Studio is conducting a food drive for the month of November. Donate nonperishable food items and receive discounts on UNITE products. First item 10% off, second item 15% off, and third 20% off. It’s time to order your Holiday Pies! Make the holidays easier by letting Huckleberry do the baking for you! 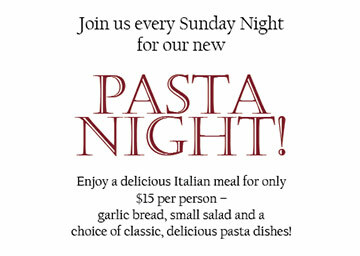 Call 303-666-8020. Deadline for Thanksgiving pies is Tuesday, November 22. Please note that Huckleberry is closed on Thanksgiving so the latest pick up time is Wednesday the 23rd. Corporate cowgirl Wendy Bohling shares career advice in a creative and humorous manner. Weaving her no-nonsense maverick voice, women will know they are not alone in their journeys to be bronco-busters in their professional and personal lives. This event is part of the National Novel Writing Month (NANOWRIMO) events at the Library. Offered in partnership with Kara Sekavec of Blue Investment Services, this class is designed to explore estate planning basics. Topics covered include how and when to set up a will or trust account, as well as create a checklist for easing the probate process. This class will help with some of the basic financial planning required at any age.